Moringa oleifera, or the “Tree of life” is a miraculous plant that has extremely potent medicinal properties that boost the overall health. It is a perfectly safe way to treat depression, diabetes, infertility, allergies, anxieties, cancer risk, and heart and blood pressure problems, and boost the energy levels! According to the traditional Ayurveda medicine, this plant has a potential to cure even 300 diseases! The traditional Indian and Asian medicine have used this plant for millennia. It is an ecologically efficient plant which can be used to fight deforestation and helps the preservation of the planet! This tree thrives best in dry and sandy areas. It has several different names, including the “miracle tree”, horseradish tree (the taste is similar to the one of horseradish), benzoil tree (moringa oil is extracted from its seeds), drumstick tree (due to the long seedpods), and ben oil tree. Other less popular names include “kelor”, “kalor”,“sigru”, “malunggay”. In Hindi it is known as“sahijan”, in Tamil -- “munaga” rungai”, and “sanjina” in Punjabi. All of its parts can be used for medicinal and nutritional purposes, so it is deservedly known as the “elixir tree” or “the medicine cabinet of mother nature”. It is believed that it is cultivated predominantly in India, but other important producers include Taiwan, Africa, Pakistan, Cambodia, Carribean Islands, Philippines, and Thailand. It is mostly grown in Asian tropical and subtropical climates, but it is also cultivated in the U.S. and Mexico as well. Studies have shed light to this plant as they have found that it is a superfood that boosts health in general and provides numerous vitamins needed for the body. 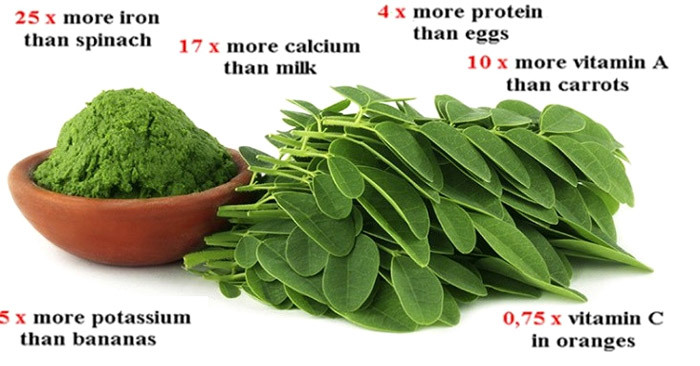 Namely, 30 grams of moringa contains 7 oranges worth on vitamin C, 4 carrots worth on vitamin A, 3 bananas worth on potassium and 4 glasses of milk worth on calcium! It is high in iron, potassium, vitamin A, C, D, K, E, B complex, calcium, chromium, magnesium, selenium, and zinc. The moringa pods, leaves, seeds, and flowers are all useful. Some use the Moringa pods for cooking, while others prefer the roots, and use them as a horseradish sauce. Some use the leaves instead of spinach or add them to soups and meals. The Moringa oil is extracted from the seeds. The leaves are the most nutritious part of the plant. They can regulate blood sugar levels and can treat malnutrition. The juice of the flowers boosts the flow and quality of breast milk in nursing, treat urinary issues, and stimulate the urine disposal. Haitians boil these flowers and prepare tea to fight colds. The seeds of this plant, when planted in pots, attract particles of dirt, bacteria, and chemical products They also extract toxins from the blood stream and detoxify the system. The consumption of raw seeds treats liver and spleen issues and soothes joint pain. Moreover, they are rich in proteins and fiber and treat malnutrition and diarrhea, alleviate skin issues, and can act as a powerful antibiotic and a fungicide. The roots and bark of this miraculous tree can be of great help in the case of heart and circulatory issues. The bark is a potent appetizer and helps digestion. If mashed and combined with salt, the roots treat rheumatic pain. The same paste is of great help in the case of kidney and lower back pain. This oil is highly beneficial in the case of prostate and bladder issues, and even hysteria! It soothes stomach problems, improves hair quality, and can be used as hair oil and in perfumes. The pods are the tastiest part of the plant, and boost the libido in combination with honey and moringa flowers. It is a powerful diuretic, and a strong asthma cure. This extremely potent natural miracle boosts the energy levels, strengthens the immune system, and lowers the risk of certain diseases. It treats sleeping disorders, diabetes, skin diseases, cancer, and even AIDS. What Are Moringa Benefits for Your Hair? it treats dandruff as it is high in zinc, and vitamin A. It moisturizes the scalp and stimulates the production of sebum. This tree is extremely beneficial for the skin, as it contains high tyrosine content (which is vital for the production of melanin), and is rich in calcium, and copper, which are extremely important for the health of the skin. Moringa body butter treats skin dryness and makes the skin smooth and moisturized. You can add it to breads, porridges, and pasta. It can be of various product types, in the form of tea, capsules, leaf powder, capsules, and Moringa vitamin supplements. Take the Moringa capsules twice daily, as they are completely safe. Moreover, you can also use the tea bags and enjoy its countless benefits. However, just to be on the safe side, make sure you consult your doctor before using Moringa or any other natural treatment to boost your health. This tree might be a real natural miracle for some, and do harm to others.